It can be used as an adequate remedy for not eating so much, especially suitable in cases where there is an uncontrollable craving for eating sweet or diets to lose weight. Hyperactivity: Oats and preparations such as porridge is a highly recommended alternative to sugary cereals for children, especially when there are problems of poor school performance, lack of attention in class or hyperactivity. 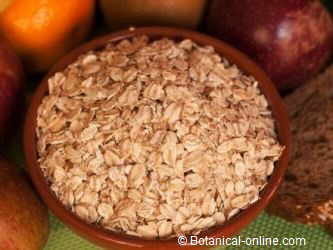 Heart health: It has been shown that the daily intake of 3 grams of beta-glucans (about 3 servings of oatmeal flakes) reduces cholesterol. It is especially recommended for people with heart problems, hypertension or poor circulation to help reduce the risk of cardiovascular accidents associated with excess cholesterol. Constipation: Its fiber stimulates peristaltic or intestinal movements, helping to accelerate transit. It also has a prebiotic effect by stimulating the growth of healthy bacteria in the intestine. These properties are increased when combining oats with yogurt or foods with probiotics, that is, foods that contain healthy bacteria that protect the intestine. Hemorrhoids: Because of its insoluble fiber content, it is very beneficial for people with hemorrhoids when increasing the volume of feces and facilitating their expulsion. Used externally, it has very interesting properties for skin care, to the extent that this cereal is part of many beauty products such as soaps, creams, shampoos, lotions, etc. Scabies: The same preparation is desirable to reduce the itch of scabies. Urticaria: Also it is effective for the treatment of the urticaria. 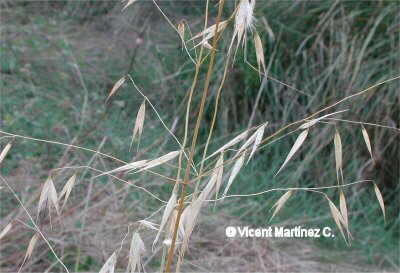 Dermatitis: Oatmeal is very useful to relieve itching. Apply a cold oatmeal with water to the affected area. 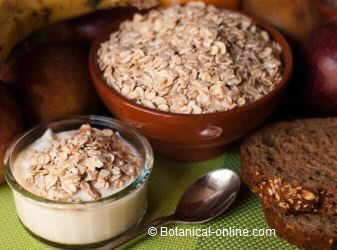 To do this you use the liquid from the infusion of a half cup of oats per liter of water. Squeeze the mixture to remove the liquid and cover with the compress. Rheumatic pains: To relieve the pain caused by rheumatic diseases can mix some oatmeal with vinegar then boiled until it becomes pasty. Place on affected area. This same treatment can be used to mitigate the severe pain of low back pain. Sunburns or burns: Oats flour cataplasm on the burn.